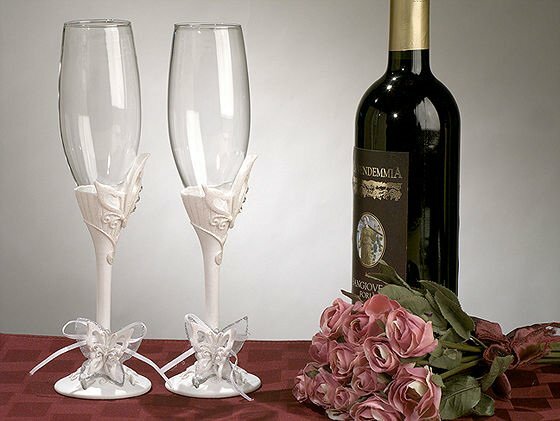 A pair of fluttering butterflies accent these delicate toasting flutes - one at the base of the stem and one that curls around the glass flute. The bases are made of resin, and the set stands 10" tall. Your glasses will arrive packaged in a white gift box. 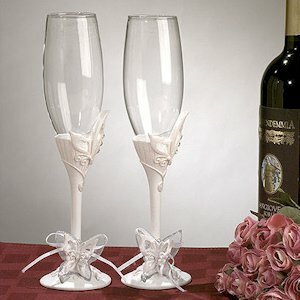 Be sure to search for our matching Butterfly wedding accessories, or purchase them all as a set! At this time, Wedding Favors Unlimited ships only with in the continental U.S.